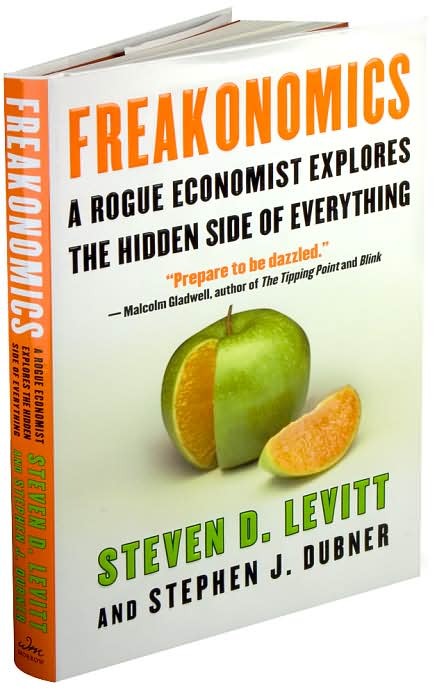 Balancing Jane: Late Night Freakonomics! This book is an interesting hodge podge of analyzed data sets. It is also apparently a movie I hadn't heard anything about. Chapter 5 is entitled "What Makes a Perfect Parent?" and comes to the conclusion that parenting "isn't so much a matter of what you do as a parent; it's who you are." The authors analyze a large set of data that correlates elementary test scores with a wide range of variables. They find out that there is a correlation, for instance, between having highly educated parents and scoring well, but not between scores and moving to a better neighborhood. Children with books in the home tend to score better, but it doesn't matter if those books are read every day, and it doesn't matter how much television the child watches. The overall message seems to be that the ovebearing parents of the world believe in correlations for success that don't exist. It doesn't matter if they spend weekends shuttling their children to cultural events, evenings reading age-appropriate books, and days structuring the child's activity to avoid mindless downtime. A child's ability to succeed (at least on standardized tests) is determined by factors that are already in place before the child is born (or even conceived). A child born to well-educated, English-speaking, thirty-year-old plus parents of high socioeconomic status performs better. Period. It's a little disheartening to look at this data at first. It makes it seem like all those hours spent trying to be a good parent don't matter. (And I know I've only had four weeks with my daughter, so I know there are a lot more hours to come). I did, I'll admit, feel a little relieved to see that there is no correlation between whether a child has a stay-at-home mother and test scores. Daycare isn't proven to stunt her ability. But what of that ability? Do I really care if my child can perform well on standardized tests? Especially at the elementary level? I'm not very keen on testing. I work with a lot of students, and I've known many that just don't test well. They are smart, creative, engaged, and headed for great things, but they don't test well. I also have known plenty of students who test great but have been lazy and uninterested in their education. Furthermore, I think that our societal focus on test scores is a large part of the problem with our current education system. 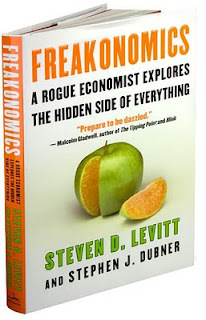 (In another chapter in Freakonomics, the authors analyze standardized test scores from the Chicago school district and find that many teachers were cheating, skewing the answers so that they would get promotions.) All of this focus on tests, especially in the early years of education, seems to leave little time for experimental educational programs and creativity. Creativity. The authors admit that this data doesn't measure things like creativity or ingenuity. It measures ability to take a standardized test, which is a dream for data analysis, but not always such a practical skill in real life. What if reading all of those books helps a child become more creative with language? This probably wouldn't show up on the test, but it's certainly something I want my daughter to be able to do. What if all of those museum trips (which do nothing to help with test scores, apparently) help a child interact with other cultures better? How would we analyze that correlation? I find the data interesting (and the book as a whole very fascinating), but I'm not convinced that standardized tests really tell us much about who someone is as a person. Therefore, I'm not ready to take a correlation with them and use it to make decisions about parenting. Plus, isn't reading books and going to the museum fun? I have no idea how the people who have influenced my life the most and left their permanent mark on my soul would score in a test, nor do I need to know. When I was studying for my finals in maths in high school my very enlightened teacher pulled me and my friend aside, he said (I remember this even 15 years later) "Girls, you have already passed the most important test, you are kind, friendly and have good friends, relax...you'll do ok". Funnily enough I got dux of Calculus (there were only 8 people in the class) but that certificate means a lot less than my teachers comment. I would be proud of my kids if they were more academic, but so far my proudest parenting moments are when they are caring, creative or filled with spirit and happiness. Congrats on 4 weeks or being a mum! Congratulations on being a new mom! I'm myself a second-time mom to a 4 weeks old baby, and an academic economist. Of course, standardized tests only measure one dimension of individual skills. However, it is important to remember that the scores on these tests are highly predictive of later educational achievement. And a higher educational achievement is itself associated with many good things like good health and high wages. The personal message I take from the research (and there is even more research I know about in developmental psychology that has roughly the same message) is that in the big picture you shouldn't worry too much about damaging your child's future with what you do, and especially what you may feel guilty about not doing. Just do what feels right to you, it will at least have the result of sharing the things you value with your child. And then don't sweat the rest, and especially there is no need to worry about being a working mother! I still worry myself about being a working mother occasionally, but less and less since I have settled in a routine I find satisfying with my older child. My older child is amazing and we have a great bond, even if I work long hours. bekkles: That sounds like a great teacher. I hope that I can pass on messages like that to my students. Johanna: I don't think that all standardized tests are bad, and I do think they have merit, but I think that sometimes we discard other, less precise measures of development and success because they're more difficult to obtain and use. I'm glad to hear from other mothers that work that feel it hasn't affected their bond. I'm already feeling guilty because I'm really looking forward to going back to work in a few weeks. I love my little girl and it's amazing to watch her grow, but I miss my job, my coworkers, my students, and having a structured workday.